Few things are stronger than the bond between a parent and a child. For some parents, this bonding starts directly after birth. There’s a reason for that — during labor, mom’s body releases lots of the hormone oxytocin, which in turn can cause mom to have strong, overwhelming feelings of love for her baby, as well as the desire to protect her baby. However, not all parents feel this kind of instant bond with their babies. Many moms feel completely exhausted after delivery (particularly if they’ve had long, difficult, or complicated labors). 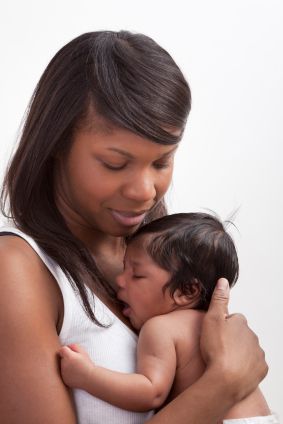 Other moms may begin to experience postpartum depression symptoms just a few days after birth. In these cases, mom may not feel an instant bond with baby — but that’s perfectly okay! Growing close to and ‘learning’ your baby is a process, after all, and one that can take some time. Your newborn will communicate primarily through his body posture, reflexive cues, and cries. But when your baby is first born, you may have a hard time decoding those cries and cues and body language! Don’t worry, though; with a little practice and lots of listening, you’ll begin to understand what your baby needs and what he’s trying to ‘tell’ you. So, listen to and watch your baby, and before you know it, you’ll be the expert on his needs! It can be so easy to feel overwhelmed when you have a newborn at home. You likely feel exhausted, thanks to all the nighttime waking. All of your usual responsibilities may feel like more than you can handle, since simply feeding and caring for your newborn is practically its own full-time job! And if you’re working on improving your newborn’s sleep, it can be easy to over-focus on what is going ‘wrong’ with your newborn and your schedule. This is understandable, but as much as we want to get sleep “right”, the most important thing is that you and your baby feel connected. So while you’re working on sleep, be sure to take some extra time to just be together. Take a bath with your newborn baby. Bathing with your baby is a great way to initiate the skin-to-skin contact that is so important for your newborns. That skin-to-skin contact, plus the combination of warm water, can be especially effective at soothing your baby when she is fussy. But remember, safety first! This article has some great tips on how to bathe with your baby in a way that’s both bonding and safe. Massage your newborn baby. Massage is an excellent way to calm and soothe your baby, and to strengthen the connection between the two of you. Incorporate some essential oils into your massage routine for an even more soothing massage! (Just be sure to read this article first, for a list of approved essential oils for babies, as well as tips on using essential oils safely). Want to know more about baby massage, or wondering how to begin? Check out our past article all about infant massage! Read with and/or sing to your newborn baby. Sure, your baby won’t be able to understand the words to your book, or to your song, but that’s not the point. Hearing the gentle cadence of your voice, and watching your face, will go a long way in helping your newborn connect with and bond to you. Learn Baby Sign Language with your baby. Again, in the newborn stage, your baby is too young to actually learn or understand any of the Baby Sign Language signs. But at this stage, that doesn’t matter. Simply watching you and listening to your voice is what makes this special (for both of you!) And of course, the added bonus is that as your baby grows, she will likely pick up quickly on the basic signs. This will lay a great foundation for going even farther in learning Baby Sign Language (should you choose to do that). Take a walk with your baby. If the weather’s cooperative, take your baby on a stroll. The fresh air will be great for both of you, and the exercise you get will do wonders for your overall energy! While you walk, don’t be shy about talking aloud to your baby — point out the sights as you pass, name objects for your baby, etc. Getting into this habit now will ensure that as your baby grows, he learns the names for common objects and sights as soon as he’s able. Or, if you are interested in personalized, one-on-one help for your newborn, why not consider one of our personalized sleep consulting packages? Our consultations allow you to work directly with one of our expert sleep consultants, and to get a Personalized Sleep Plan® that will work for your family.